It is exciting to see a local plan finally taking shape for York, and we are pleased to see cyclists considered and included in the Sustainable Development plans for York (DP2) and in the Sustainable Access plans (T1). We are also pleased to see that many of the planning policies for specific sites emphasise the need for routes to encourage pedestrian and cycle movements into and through the site. However, we have grave concerns about the vision outlined in the Transport Topic paper, and we are dismayed at the lack of consideration given to cycling and other forms of sustainable transport in this paper. Below we outline our main concerns in the Transport Topic paper. We question the way in which future traffic projections have been estimated using the transport model. We note that the words ‘bike’, ‘cycle’, ‘bicycle’, or ‘cyclist’ do not appear in this document at all. The paper doesn’t give details of the parameters used in the transport model, but we can only assume that cycle traffic is not included in the model. Given that ‘active commuting’ (cycling and walking) have been shown to dramatically reduce the risk of heart disease and cancer and that encouraging cycling is recognised as a key way of reducing air pollution we are concerned to see that cycling is not included in the model. The omission of cycling (and other forms of active travel) directly contradicts a number of the objectives laid out in the Sustainability Appraisal, in particular objectives 2, 6, 7 and 12: Improve the health and wellbeing of York’s population; Reduce the need to travel and deliver a sustainable integrated transport network; To minimise greenhouse gases that cause climate change and deliver a managed response to its effects; and Improve air quality. Looking more deeply at the data, we question the projections produced by the transport model. We note that the Strategic Housing Market Assessment predicts a population increase of 15.7% between 2012 and 2032: a total of 17,096 households (page 9, Table 2, Projected Household Growth 2012-32 – range of demographic based scenarios, Strategic Housing Market Assessment Update, (2017)). At an average of 866 houses per annum this equates to 12,990 extra households over the following 15 years. Meanwhile, the Transport Topic paper states that the transport model predicts a 21.3% increase in trips (passenger car units) in the morning peak travel time for 2032/33 compared to that for 2016, and a 19.9% increase in trips for the evening peak travel time for 2032/33 compared to 2016 (Table 3, page 14, Summary of primary impacts for the 2032/33 future year, Transport Topic paper). This equates to an extra 7,295 trips in the morning rush-hour period and 7,442 in the evening rush-hour period (Table 3, page 14, Transport Topic paper). Furthermore, total vehicle travel time is predicted to increase by more than 30% in each peak hour (reference), and total delay is expected to increase by between 55 and 57% in each peak hour (reference). These transport model figures suggest that the additional 12,990 households will generate approximately 7350 car journeys twice per day, at peak times (assuming private cars are responsible for generating the extra traffic in the model). We believe that these numbers are highly questionable, based on the evidence in the following paragraphs. 2011 Census figures for York say that in 2011, approximately one quarter (21,808 of 83,522 households) of York’s households did not own a car or a van (Table KS404EW – 2011 Census: Car or van availability, local authorities in England or Wales). This suggests that of the additional 12,990 households to be built in York by 2032, we can expect around one quarter (3,248) not to own a car or van, leaving around three quarters of the new households (9,742) with one or more car or van. Following this logic forward, the Transport Topic paper’s transport model would then suggest that these 9,742 extra households will be responsible for generating an additional 7350 car journeys during morning and evening peak times by 2032. Currently York’s dependency ratio of its dependent population to its working population is 52.9%, indicating that a significant proportion of households are not economically active and are unlikely to need to travel during peak travel periods. Meanwhile a sizeable proportion of York’s population may own a car, but still choose to travel sustainably for much of the time; by bike, bus, train or foot for example. In 2014/2015 14.8% of adults living in York said they cycled at least three times per week (Table CW0104 from the walking and cycling statistics tables produced by the Department of Transport). Assuming that York’s dependency ratio is not projected to change dramatically over the next 15 years, and that residents travel habits remain similar, we think that the forecast indicating that 9,742 households will generate around 7,350 trips during both morning and evening peak periods seems very high. And we are concerned that this transport modelling does not take the pro-sustainable transport elements of the Local Plan’s policies that encourage a ‘fundamental shift’ away from the private car (as argued for in the Sustainability Appraisal document – Air Quality 4.9.3)reference for where it says this in the local plan). We also feel that this transport model is failing to take into account likely changes in traffic and pollution legislation in the future. Air pollution carries a heavy health burden. In York, air pollution is currently estimated to be responsible for 100 deaths per year and nationwide it has been implicated in increased respiratoryrespiritory illnesses and other long term negative health impacts. If traffic levels and congestion increase then air pollution is only likely to become worse. Ultimately the city of York is likely to be forced to take action to reduce air pollution, perhaps by introducing congestion charging or equivalent. Already we see this happening in other cities, with congestion charging now well established in London, with additional charges for older and more polluting vehicles, and now the consultation over the introduction of a zero emissions zone in central Oxford by 2020. We think the local plan represents an opportunity for York to lead the way with addressing air pollution and congestion, finding a solution that works for our city, before a solution is imposed upon us by national regulations and government. We believe that increasing the level of cycling could be a big part of the solution for York and will ‘future proof’ our city to ensure it functions for everyone for decades to come. Table CW0104 from the walking and cycling statistics tables produced by the Department of Transport reveals that in Cambridge (a city with many similarities to York) 39% of adults cycle at least three times per week; more than double the 14.8% of adults that cycle at least three times per week in York. There is no reason why York should not aim to achieve similar levels of cycling, and enjoy the associated benefits of improved health, reduced air pollution, reduced traffic congestion and reduced greenhouse gas emissions. We find it bizarre that the transport topic paper doesn’t mention cycling, or give any data on cycling habits now and how they might change in the future. We know that the council has data on cyclist numbers from the traffic counts that are carried out each year. In addition it wouldn’t be difficult to obtain more specific cycle data with new tools that are now readily available. For example, cycle ‘heatmaps’ can be obtained from Strava at no cost, showing the key routes and diversity of cycle movements in particular areas. Meanwhile, for a small cost Strava Metro will provide more in depth data, and already city planners in over 70 cities, including Glasgow in the UK, are using this data to shape transporttranport policy. There is clear evidence from cities such as Copenhagen (where an impressive 62% of adults cycle to work every day) that continuous cycle lanes, that are segregated from traffic, encourage more people to cycle. Many other features, such as readily accessible bike racks, ramps on stairs, space allocated on trains and buses, and well-designed way-finding all help to increase the proportion of people regularly riding a bike. For example, the city of Cambridge encourages cycling by accommodating hundreds of cycles in its excellent city centre undercover parking, and even lending pushchairs to enable families with young children to transition from bike to foot when they reach town. We would like to see cycling infrastructure in York provided to a technical standard that is higher than the national requirements, targeting best practices such as those set out in the Sustrans Handbook for Cycle Friendly Design, CROW, and other evidence based publications. York is ideally placed to make ‘active transport’, including cycling, more readily accessible to everyone. If York did embrace an active transport model it would reduce the pressure for parking spaces at new developments and within the city centre, and could potentially help York to meet its future housing needs, enabling higher density housing to be constructed on new developments. Already other cities in the UK, including Norwich, are successfully embracing low car housing developments, and there is ample research to draw upon to ensure that active travel is fully integrated with low car developments. Why are traffic levels and delays predicted to increase at a greater rate than population increase? Why hasn’t the impact of cycle traffic (and other forms of ‘active travel’) been included in the transport model? What assumptions were made regarding peak time usage requirements in the transport model? How many cars per residential unit are assumed for the planned housing developments? Has York’s ageing population and its impact on the dependency ratio been taken into account in these calculations? Has the impact of emergent and new transport technologies (such as electric cars, electric bikes and disability adapted bikes) been included in the modelling? To conclude, we think this local plan represents an exciting opportunity for York to forge its own future, and to be a leader in shaping and adapting cities for the challenges that lie ahead. The York Cycle Campaign is keen to be involved in supporting a progressive and sustainable vision, that will ensure the future of our wonderful city for generations to come. However, we feel that the current transport model (and the assumptions that it rests upon) must first be revisited, to ensure that all aspects of York’s local plan are based upon rigorous evidence and that all forms of transport, and their impacts upon each other, are carefully analysed. The local plan document includes some substantial additions and alterations to the strategic road network including the enlargement of roundabouts on the outer ring road (estimated cost £37m), junction improvements, and the longer term plan to upgrade the outer ring-road to a dual carriageway (previous reports have suggested costs as high as £200m). We question the evidence upon which these additions and alterations to the strategic road network are based. If the infrastructure improvements proposed have been in any way based on the transport model (which we have pointed out to be flawed in the previous objection) this would be very concerning given the levels of investment involved and requirement to prove a good and accurate cost to benefit ratio. We also question whether these infrastructure improvements really represent the best value for money and can really be justified economically. We presume that these numbers are based on an the transport model predictions of an extra 7,295 trips in the morning rush-hour period and 7,442 in the evening rush-hour period by 2032/2033: projections that we have already robustly questioned in our objection to the transport topic paper. Again we reiterate our argument that we think these traffic growth projections are overly high, and hence we question the need for such extensive changes to the road infrastructure. We note that it is now widely recognised by transport professionals that road widening and increasing capacity delivers only short term relief, and actually increases the number of motor vehicles, a phenomenon known as induced demand. 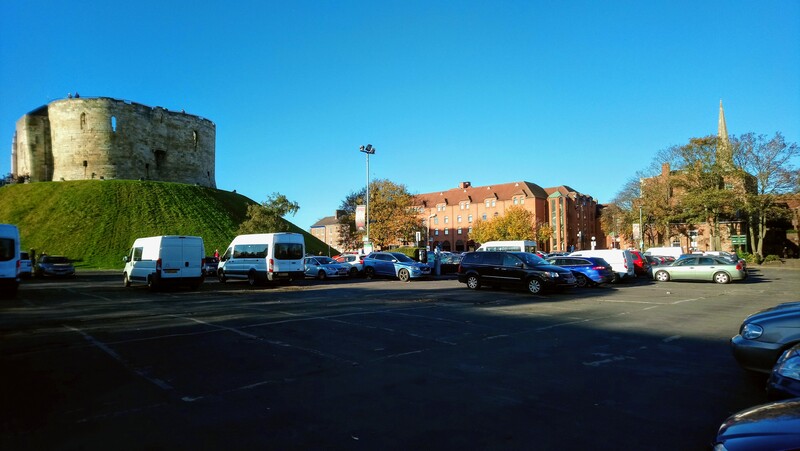 We fear that there is a real danger that the proposed alterations and additions to York’s strategic road network (in particular the dualling of the outer ring road) may ultimately only add to York’s traffic congestion. In 2005 an A1237 York Outer ring road transport study was carried out and it was concluded that it would not be cost-effective to dual the outer ring road. Looking forward we fail to see how it can be considered cost-effective to spend at least £115m (estimated cost in 2005) to accommodate an additional 7350 drivers using the road network twice per day. We note that £115m would also pay for approximately 300km of segregated cycle path which arguably would do more to reduce traffic congestion, improve air quality, improve public health and reduce greenhouse gas emissions. We feel that many of these additions and alterations to the strategic road network directly contradict a number of the objectives in the Sustainability Appraisal; namely objectives 2, 6, 7 and 12: Improve the health and wellbeing of York’s population; Reduce the need to travel and deliver a sustainable integrated transport network; To minimise greenhouse gases that cause climate change and deliver a managed response to its effects; and Improve air quality. York Cycle Campaign would like to see full reasoning and justification for the suggested substantial additions and alterations to York’s strategic road network. We strongly question the transport model that we presume these additions and alterations are based upon and we would like to see the parameterspararmeters that have been used in the transport model, to understand the traffic projections it produces. We also feel that it is imperativeimperitive that the council presents a strong economic rationalerational for making these substantial changes to the road infrastructure. Furthermore, we would like to see appropriate economic weighting given to additions and alterations to cycle and pedestrian infrastructure, in line with the percentage of traffic (in terms of number of people) that the active transport infrastructure supports.